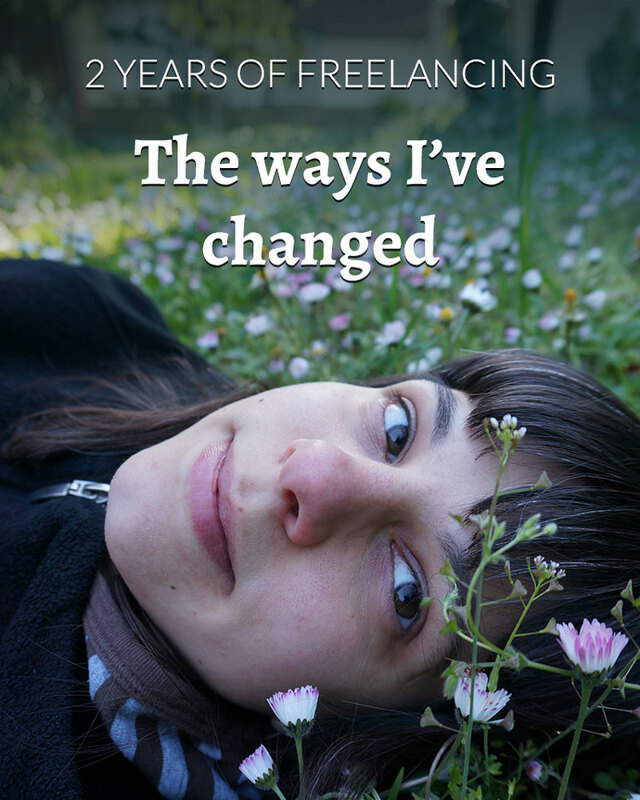 September 1st was the second anniversary of me going out on my own and becoming a full time freelancer. I'll be frank and admit that my numbers are nowhere near where I'd want them to be, and things have been getting on track only in the recent months because of some changes I've made to my business. So there's that. I'm not living a six figure dream working 4 hours a day. I don't have an Amazon bestseller, or a course hundreds of people have gone through. But there are other things I value, that have improved so much in the past 2 years, and that's what I want to talk about. Some of my friends who are thinking about starting their own businesses tell me how they're not really sure they have what it takes, and that I seem like the sort of person who's just good at this stuff. "You understand all the business and all the legal stuff, and I'm just so overwhelmed by it", they say. As if I crawled out of the womb with this knowledge. I want to show you that I didn't – that I struggle as much as you do. That I had to work hard to learn it, and then put it into practice. I want to show you that I don't have a special talent you don't – it's been a matter of showing up every day. Yet, for a while I haven't seen any difference. I thought it was all in vain, and got into a pretty bad depressive episode. I felt discouraged and like it just wasn't fair. But then almost "magically", things started to shift. I started seeing the results of all the hard work I've been putting in – first really small and subtle, and then more noticeable and significant. I went through some serious shifts that I was able to identify, and I had no idea when and how they happened. Except that's not entirely true – I actually do know. All that work I've been putting in without seeing any results? Apparently the results did come, only not when I expected them. Little by little, some facets of my personality changed, and I became better at what I do. From a fearful newbie with painfully low self-esteem, I grew into a person that looks at a serious challenge and says "You know what? I can handle this. It's going to be just fine." Two years ago I had no idea I had it in me. The only reason why I even dared tread on this path is that I saw no other alternative. I was prepared to do anything but to go back to a job where my passion was extinguished. Some "thought leaders" like to say that having your own business is the best personal development and spiritual advancement tool you can ask for – much more effective than living in a monastery. I haven't tried living in a monastery so I can't be the judge, but I can attest that by choosing this way of living, you choose a life of intense growth. And growth is what's on the agenda today. I will list some of the changes I've observed inside of myself and what a difference it made in my life and my business. This is a total cliche. How many people have you seen saying that? But what can I do, it's true. I won't say I'm good at saying no, but compared to what a people pleaser I used to be, I've made tons of progress. I used to say yes to every single demand on my time, and had no idea how to form a polite sentence that would inform the person I'm not willing to do that and not have them think I'm selfish. I was so desperate to come off as a nice person, that it was interfering with my wellbeing. Now I'm comfortable saying no to people who want me to work for free and I don't feel guilty, because I know that if I do, I end up broke and resentful. I'll take the "selfish" label over "broke and resentful" any day, thank you very much. I have also started limiting the number of meetings I'm willing to attend in any given week, and when they will happen. My response used to be dependent on whether I had a free time slot in my calendar or not. This meant that whoever got to me early enough was able to meet with me practically whenever they wanted. Then I realized that I just can't have more than 3 meetings per week, ever. On weeks when I'm super busy with projects, it's down to 2. I got to this number through experimenting and writing notes in my planner and I've accepted that this is just how I work right now, and I don't care if other people are able to pull of more. This should be one of those things you do before you even start a business, but many of us don't, and begin with a completely wrong premise about what we do for people. In the beginning, my positioning was lame and boring, and I had no idea how to differentiate myself from other designers. I thought the quality of my work is supposed to be enough, and if people would just look at my portfolio and see how good I am, that will make them hire me. It was only in 2015 that I figured out how my personal values and my mission play into my design work, and changed my branding and my positioning accordingly. As a result, I've rediscovered the passion I had lost and dug out a host of topics that I can talk about, which lead me to finally starting to write about design again. By identifying the real value of my work, as opposed to the cosmetic value of design that most people perceive, I realized that I'm able to help people charge higher prices for their work and get access to clients they really want to be working with. This change lead me to another one that creative business owners struggle with, because it makes us feel "icky". I think this warrants a separate post where I’ll share some tips, because it’s something people tend to struggle with a lot. The first step is of course, to claim the value of your work. Unless you’re 100% sure in the value you deliver, you won’t be able to stand behind your prices. Now that I do, I have no issues giving a proposal even face to face, no matter who asks. I state my rates without a hint of apology – that’s what I need to make in order to stay in business. If there’s someone else charging half the amount, that’s not my problem – I don’t have to compete on price. My clients know why they choose to work with me. I’ve found that having a table of standard rates (even if you do totally custom work, like I do) is helpful because when you’re put on a spot, you can just read the number and say it without thinking twice. Where we tend to screw ourselves over is when we start thinking too much, and then hem and haw and put in little disclaimers... no. Stop that, it makes you look like you don’t know what you’re talking about. When you state your price with confidence, people believe you. Version 1.1 of my website design didn't even have a mention of my services on the homepage. 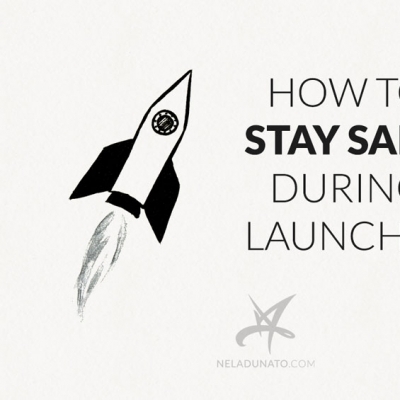 I never invited people to work with me in my blog posts or my newsletter. I never offered to help other business owners I met in person. I never followed up after they gave me their business card and asked me to contact them. I never sent pitches. I never made up-sells of additional services in my proposals. I never contacted my former clients to check in with them and see if they need any more help. In short, I was terrible at selling. After discovering the real value of my work, I had less and less qualms about saying "Hey, this is what I do, and if you want it, you can get it here." It wasn't a quick and easy process, but I've gotten over the initial discomfort, and gradually, veeery gradually, gotten myself to a point where I can, and do a lot of the things I mentioned above, and I'm still able to look at myself in the mirror. Just last month I sent two e-mails (on the same day!) that made me realize what a huge shift I've made with this. The first e-mail was a pitch to an organization for a workshop on branding for freelancers that I want to do for their members. I just woke up one day and thought it would be a good idea, made a nice PDF document with the details and outline of the workshop and wrote an e-mail. I sent it without even a twinge of questioning like "What if they think I'm an idiot? What if they think it's a stupid topic? What if they already have someone on board who wants to speak about branding?" I just didn't give a damn. I know the value and I'm ready to deliver it. It's their choice of whether they want to take me up on it or not. The other e-mail was about my work the Phoenix. I get at least one e-mail every month from people inquiring if they can buy the rights for this image or use it for free. Each time I replied before, I said no (because it's already licensed to a client) and offered some links to stock photo websites and wished them luck. This time I did something different. Instead of sending them to someone else's website where they can get a stock graphic for a few dollars, I offered to create a custom design for them and linked my newly redesigned logo design services page. When I did that and sent it, I wanted to bang my head against the wall for every such missed opportunity in the past howevermany years. But the reality was, before that, I simply wasn't in the mental space to make this offer. I was ashamed of offering my work when they haven't explicitly asked for it. Except they were asking for my work. I just hasn't made the connection between what they needed and what I could give them, because I was so focused on what they said they wanted. We seem to wait for some kind of special permission to sell, and it will never arrive. I freelanced for years without ever having to make a sale because people sent inquiries on their own, and it’s wonderful when that happens, but why wait to be picked? If you don’t ask, you won’t get it. This goes both for personal and professional life. I’ve been so bad at asking for things. The problem is that when I get assertive, I get really assertive, and sometimes my requests feel like demands. The reason this demanding behavior happens is that I expected people to know what I want without me having to say it, and when it doesn’t happen, I get angry. That’s a totally unrealistic expectation on my part. People will naturally avoid doing more than they really need to, not because they’re evil, but because it’s how humans work. I’m the same way, and I’ll keep a blind eye on that pile of clothes waiting to be folded until it’s called to my attention. Another tripping point is that we don’t want to impose our needs on others, and think that if they want to help us, they’ll find a way themselves, and we’ll never need to ask. Again, we’re making people do the hard work of anticipating our needs that we haven’t explicitly stated. Asking the question makes things a lot easier for them – they can answer either “Yes” or “No”. They’re free to say no just as we are. We’re not imposing by merely asking. Now I’m able to make a request without sounding demanding (reading “Nonviolent communication” helped me learn how to do that). People respond very well to that, and we can skip the whole failed-mind-reading-resulting-in-angry-demands ordeal. However, writing on the forums and personal blogs is one thing, and writing on your business blog is a whole other matter. I was a bit wary when I first started this blog, and didn’t want to offend anyone. I still didn’t fully believe that people would be willing to hire me if I show my humanity. After a few years, I’ve noticed something about myself – I was most attracted to bloggers who were not only vocal about their personal beliefs, but were also completely comfortable with people not resonating with them. They had plenty of experiences with haters, and made it clear that no matter how uncomfortable it gets, it’s still so much better than keeping quiet and watering yourself down. Being surrounded by folks like that gave me all the encouragement I needed to start writing more openly about how I really feel about art, professionalism, branding, design process and even mental health. I’m dedicated to finding people who are open to the ideas I share here, even though these ideas may not be very popular. When we start freelancing, we’re painfully aware of how little we know about business, marketing, sales, law and other things unrelated to our expertise. This leads us to eat up all the advice that’s offered to us and we keep searching for more, more and more. After months of that, you start feeling a bit crazy. Never ending stream of information. Conflicting advice. Best practices changing due to technology changes. New stuff popping out that you never knew even existed. Fear of missing out on the pricy, premium program that presents itself as a solution for all your problems. Usually when I feel this happening, I go on a mind detox retreat to flush it all out of my system. After a few rounds of those, I realized that no matter how much I learn, this will go on as long as I allow it. There is no point at which you feel you know “enough”, so you’re no longer tempted by the shiny, new things that pop up all the time. I just realized I’m getting tired of the crazy, and I’d just rather become more selective about what advice I listen to, and how often I tune into it. I’ve figured that with the current knowledge I had, I could be implementing new solutions for at least a year, with no other input on the side. I could completely stop consuming all the blogs, podcasts, videos and courses and still have plenty to go off and grow my business. Once I realized that, the pressure to learn more and consume more subsided. When I hear about a new marketing tactic, I weigh it against my values and my current strategy and quickly decide if it’s something useful for me or not. I’m comfortable completely ignoring certain type of advice, no matter what results it promises. I’m quicker to unsubscribe and unfollow when I feel like I’m not getting what I need from a certain source. Even if everyone else thinks they’re awesome and smart and worthy of listening to. I spent way too much time on reading productivity advice, and sometimes it has left me feeling inadequate, because I wasn’t able to put some of the advice into practice. Later I realized that not all the advice is created for all people. We all have our quirks, and the point is not in squashing them, but using them to our advantage. Some people say it’s best to write your to-do list in the evening for the next day. I have better results when I check in with my energy in the morning and then decide what to work on. Some people sit down to work with a cup of coffee as soon as they get up. I don’t drink caffeine, and prefer to start my day with meditation, journaling and sketching until I’m fully awake. Some people love to chip away on a project day by day and make consistent incremental progress, while I love short, intense campaigns and launching fast, before my momentum blows out. I used to think as these things as weaknesses – now I accept that it’s the way I am, and that I don’t need to change it to become “more productive”. What I need to do is learn to use it and plan for it. This also means that I no longer think I need to apologize for my way of working. I know that not reading e-mail until noon means I get to be fully focused on my creative work, and this is better for my clients than me responding to their message within 15 minutes. I know that taking a day off when I’m on my period means I don’t have to spend the day frustrated because my body refuses to cooperate, and that I’m more energized the following day. I constantly battled inner voices that told me it’s indulgent and not normal for the culture we live in, and I had to learn to stand up and say to these voices “and that’s the problem with this culture that we’re here to change”. I wrote about fear of failure and my inability to finish projects because of perfectionism before, and this is the top reason why I don’t publish as many things as I’d want to. Like many creatives, I have unreasonable standards of quality, and expect myself to do single-handedly what other people have entire teams for. Luckily, several bloggers in my online circles spoke to this problem on many occasions, and it has somehow managed to wiggle its way through my thick skull. I haven’t overcome this completely and probably never will, but I’m much better than I was before, and no longer lose sleep over whether something I did was “good enough”. I’m aware that my own perception of quality is overcritical (and I know why that is), and that the majority of people won’t even notice all the flaws that I see. If I never publish and see how people interact with my creations, I’ll never get a chance to improve. These past 2 years have been all but easy, and your kind word of encouragement helped me keep my focus on my dreams, instead of getting discouraged that I’m not making progress as fast as I wanted to. It’s an honor to have your attention and I intend to use it wisely, and provide as much value to you as I possibly can. This is just the beginning, and I can’t wait to see into what sort of person I’ll grow into in the years to come. If you feel inspired, share some of your own stories and lessons from your own self-employment journey in the comments. Let’s keep supporting each other to the top. 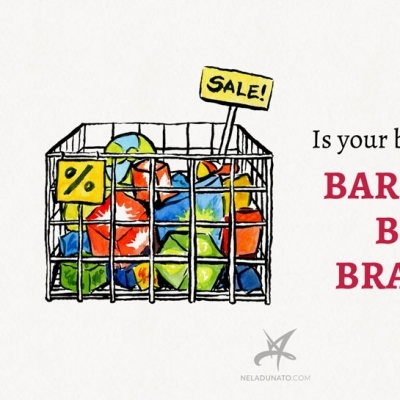 Is your business a bargain bin brand? Nela, this post really spoke to me. I can't agree with everything you said more! I'm a little over a year in, and just now feel like I can implement my own plan and build my business in a way that feels right for me. I think we all have to go through that learning curve, especially as creatives, to come out on the other side blazing. The key is that we show up every damn day and keep trying, tweaking, and putting our gift out there. I love the way you write and that you aren't just spewing back all the same advice out there. I can tell that what you write comes from your true self, and that is so difficult to find in other blogs. Bravo on 2 years! Here's to many more! Trista, thank you so much! I agree, there's so much to grasp in the beginning and it does take time... but seeing how other people managed to have bigger results so much faster, I was convinced it was something I must do as well, else I'm a failure. Guuurl, kudos on the immense progress! And I totally hear you on the depression. I actually had something like an episode earlier this year which put my biz basically on hold for months... much admiration for baring yourself this way. And ofc congrats on your bigger success! Big hug to you, and cheers to our success and well being! Brilliant post! This is an echo of my own experience so far. I started out knowing noting about running a business, more or less broke and no self esteem... I started rebranding my business as late as this march and is sooo frustrated that I did not think of these things before. But like you, I simply was not in that frame of mind before. I too have been going in to hyperdrive and wondering if it will pay off (still to soon to see, for me). Thank you so much for this post, I can relate so much, especially about accepting your own quirks when working, and then learning to work them! It's such a shame that in the midst of it, we don't realize this is what it's supposed to be because certain things simply take time. I thought that I was incompetent and beat myself into the ground with all the "shoulds". Oh! Love this - especially that you've found increased confidence with your boundaries, prices and putting your work out there! I'm still trying to de-program myself from the expected/classic/corporate ways of working, but it's getting easier and easier to set my own pace and schedule with each month that passes. Oh yes, that's a really powerful program right there. Living with a partner who has a "regular job" was also triggering for me, even though he never criticized it. But I've felt unwarranted shame in front of him, my friends, my parents and clients who conform to a 9-5 schedule. I love this! Pricing and pitching with confidence in particular resonated with me. @Sage: Thank you, I'm really excited about it :) It wasn't easy believing in myself before I saw any results, but it started paying off. I think a lot of the confidence comes from doing it, and then realizing *people didn't end up hating you*. Ties back into the people pleasing thing. @Cherry: Thanks so much for your kind words!